Apple seeded 4th pre-release of their next mobile firmware version, iOS 8.3. The iOS 8.3 beta 4 now available to download for registered developers as well as the public users too. It can be downloaded from the “iOS developer Center” or as OTA. The first beta of iOS 8.3 was arrived in February 9 2015, just after a week iOS 8.2 beta 5 released. After the one & half months, Apple has seeded four beta testers for the registered developers with this release. With iOS 8.3 beta 3 release, Apple introduced new method to get beta programs. They allow public users to download beta versions of software from “Apple Beta Software Program“. So, you no need to be a registered developer so far for receive further beta updates. 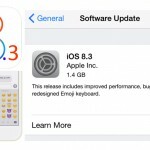 March 12, 2015 – iOS 8.3 beta 3 released for the developers as well as the public testers. How to receive iOS 8.3 beta updates for your device (you aren’t registered developer) ? Sign in with your AppleID to join the Apple Beta Software Program. Click on “Download Profile” button in section 2 to download the configuration profile for your device. What are the idevices, which are able to install iOS 8.3 ? Following iPhone, iPod, iPad & iPad Mini devices will be supported to download & install upcoming iOS 8.3 firmware. Please make sure back up your device with iTunes, before install beta software. The public beta software is still in development stage, so, some applications, functions & services may not work as expected. Please do not install beta versions of software on business systems. How to get Cydia on iOS 8.2 beta using TaiG or PP jailbreak ? iOS 8.2 jailbreak will be supported also for iOS 8.3. Yes, it will release recently.